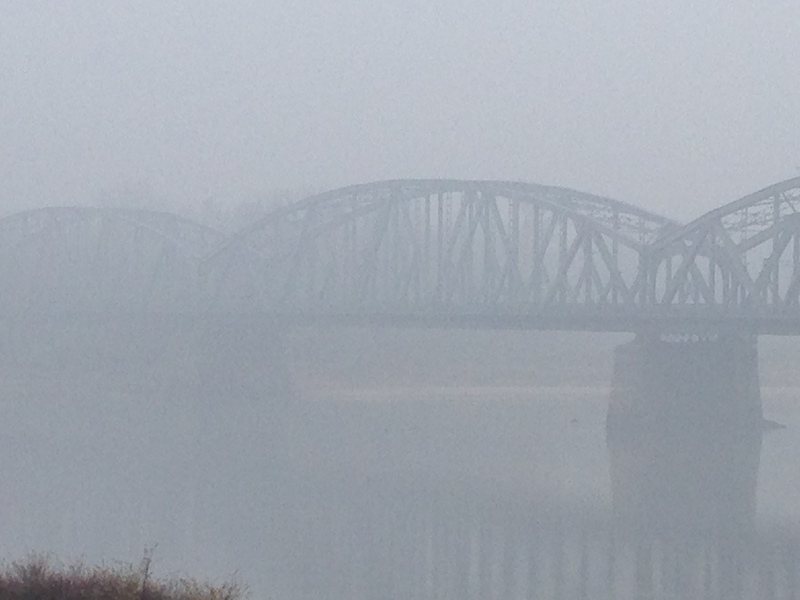 It was so foggy when we got to Torun that you couldn’t see the opposite side of the river…and could barely make out the bridge. Although we did manage to find this landmine that is next to one of the gates to the city. 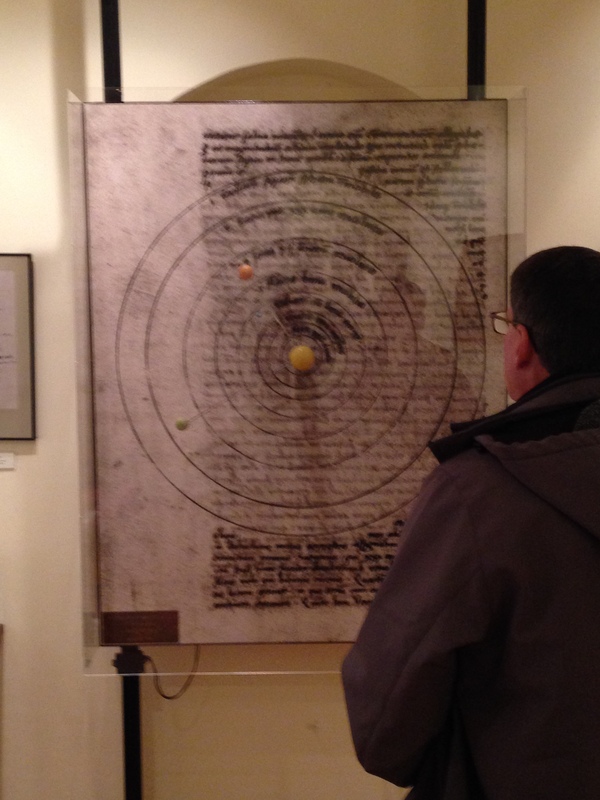 First up was a visit to the Nicolaus Copernicus house. It is believed that the famous astroner lived in this house when he was growing up. 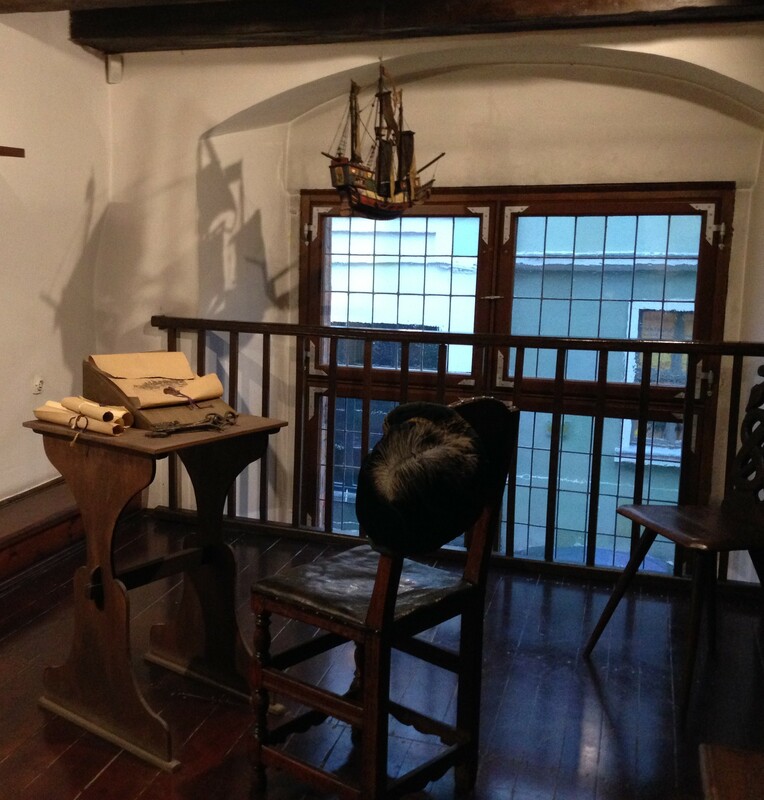 It’s now a museum filled with replications of his drawings as well as examples of what the living spaces might have looked like during his lifetime (1473-1543). 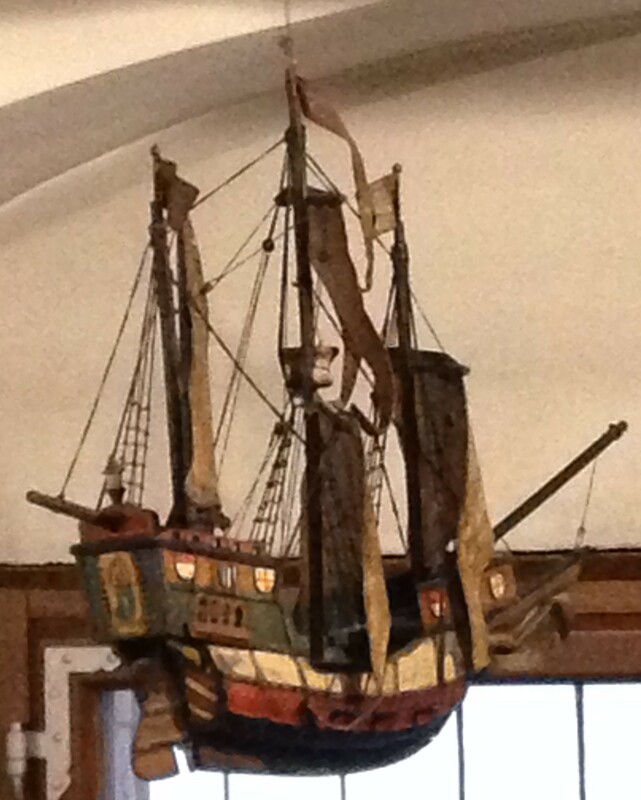 David was fascinated by this ship model that was hanging from the ceiling, while I liked all the scroll work on the doors. 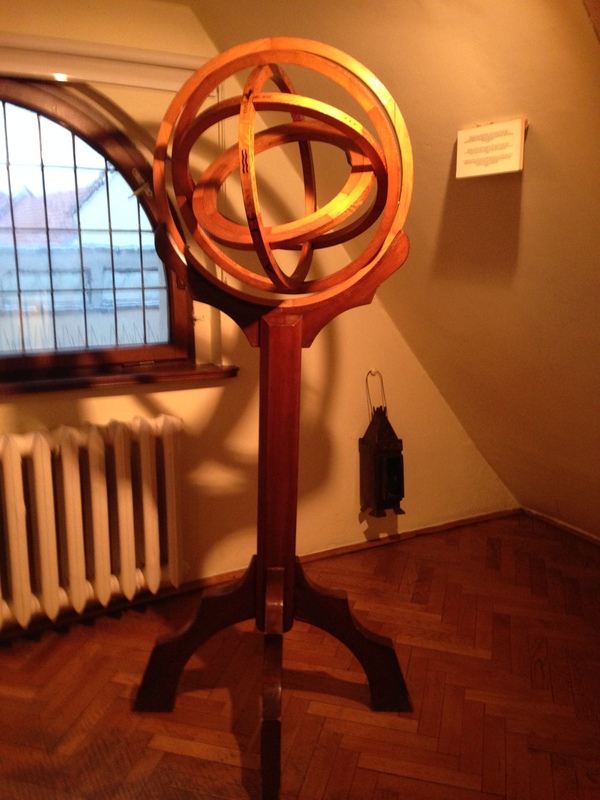 Up on the top floor there is an exhibit of the instruments that Copernicus used in most of his astrological obeservations. This is an Astrolabe. It is made up of six hoops with scales, one for every six circles in the celestial sphere and was used to measure the elliptical length and width of the planets and to measure the local time. 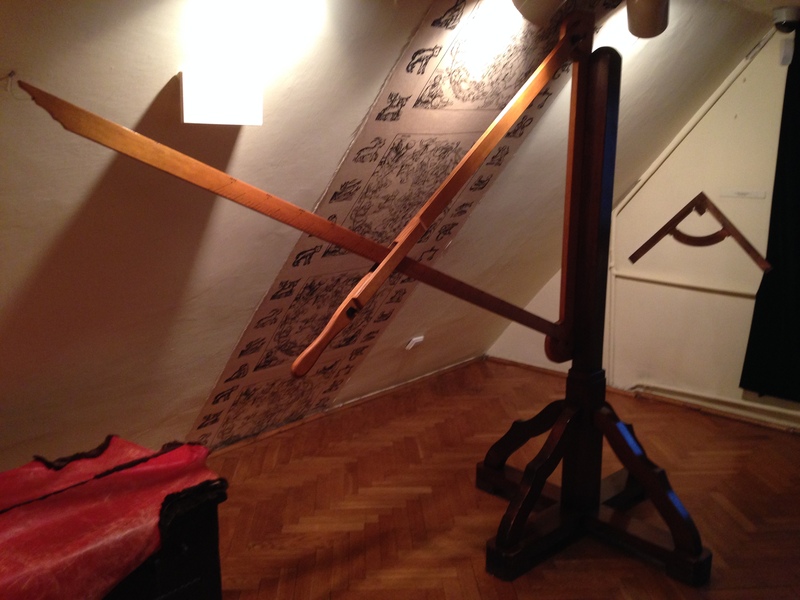 It was hard to get this next one all in one picture as the space was small, but it’s a Triquetrum, a parralatctic instrument. What is that you ask? 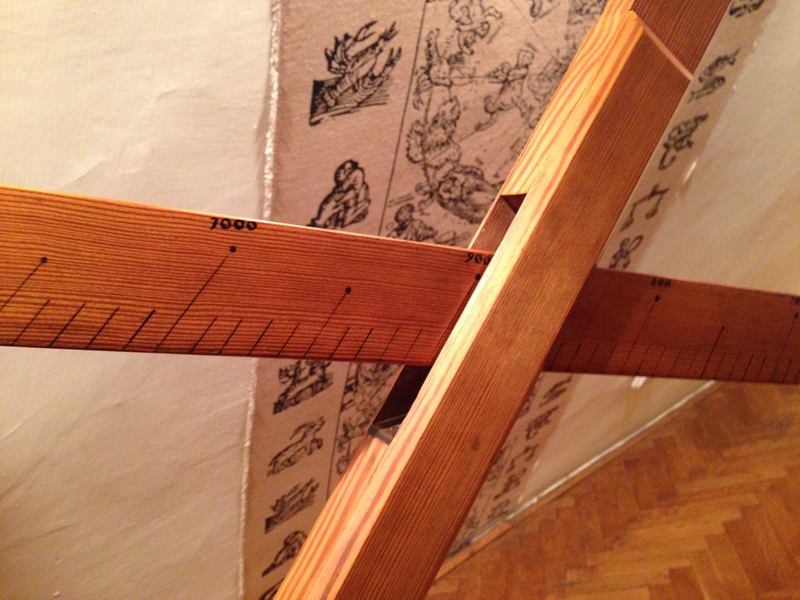 Good things I can read the display card….simply put its an instrument that is used to determine the angle of the radius of the earth to the moon. Why is that important? Because that angle is used to determine the distance of the moon from the earth and also to measure the distance of the zodiakal (Polish spelling) stars. In other words its important in the astronomy world. Nicolaus Copernicus also identified the concept of a heliocentric solar system, in which the sun, rather than the earth, is the center of the solar system. This is model of that solar system. 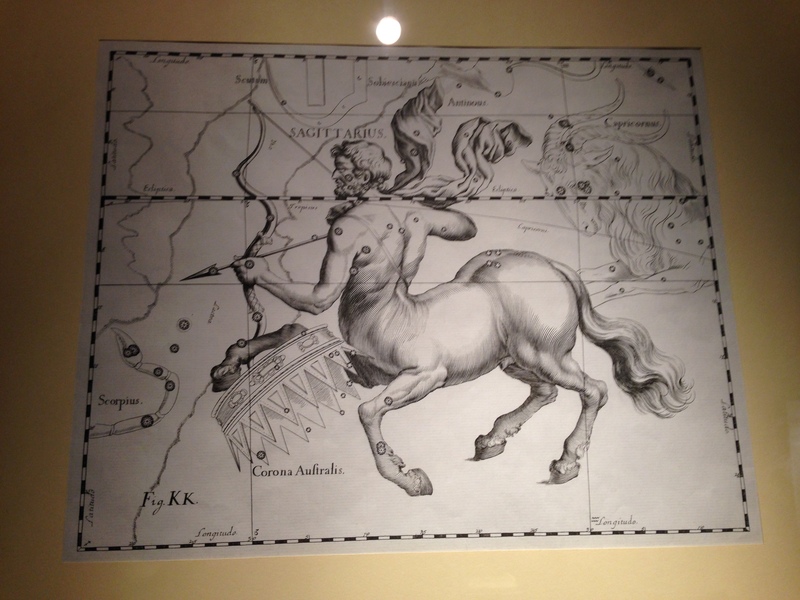 Also on display are copies of the intricate drawings done by Copernicus of the Zodiac signs. 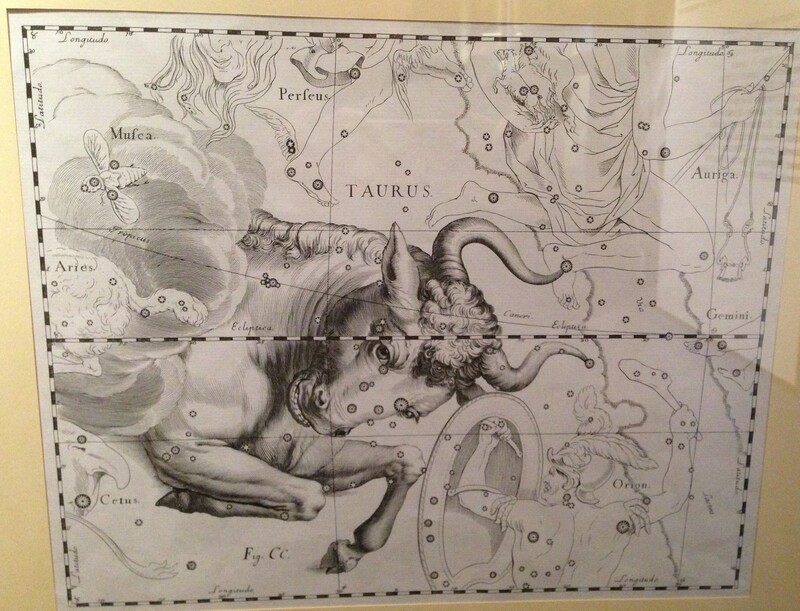 David is a Taurus….a bull. And I am a Sagittarius. 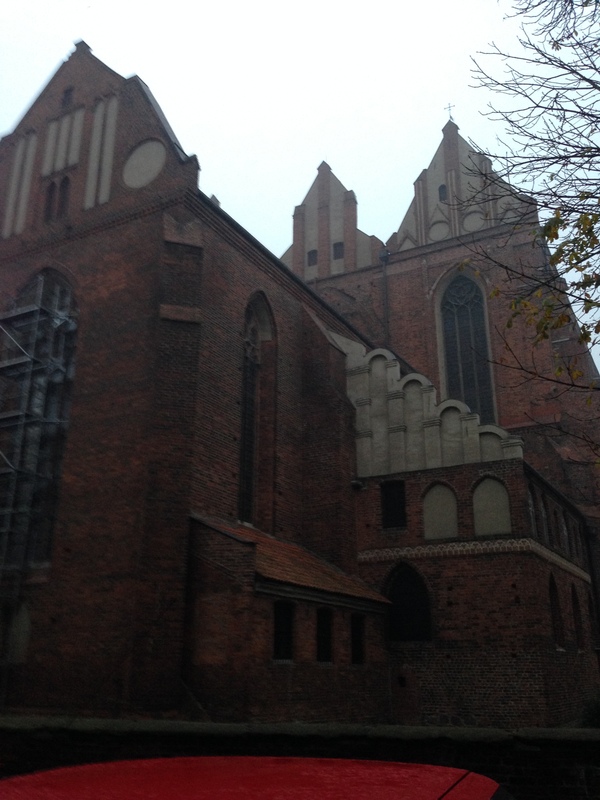 After we finished looking around the house (museum), we walked to the end of the street and saw this church, The Torun Cathedral or Church of St. John the Baptist and St. John the Evangelist. 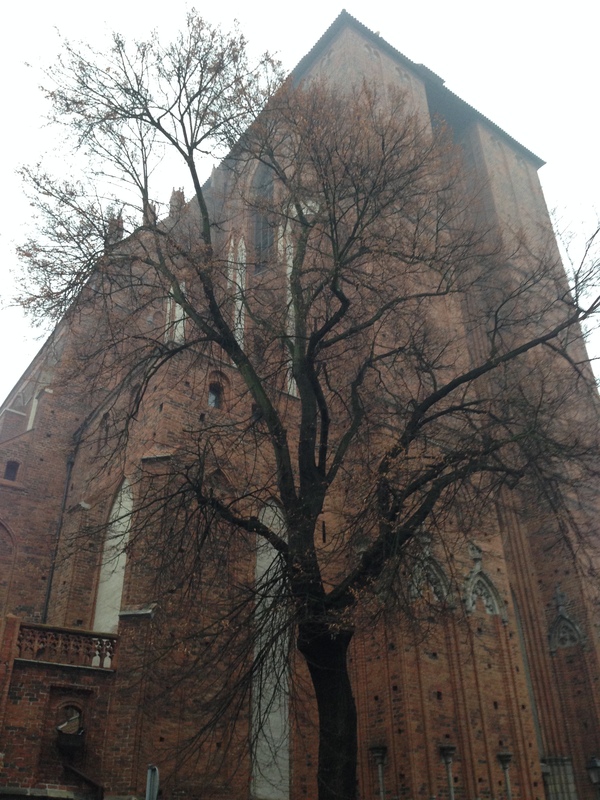 It dates back to the 13th-15th centuries and now it takes up about an entire block and is one of the largest churches in Poland. One reason why I couldn’t get it all in the picture. 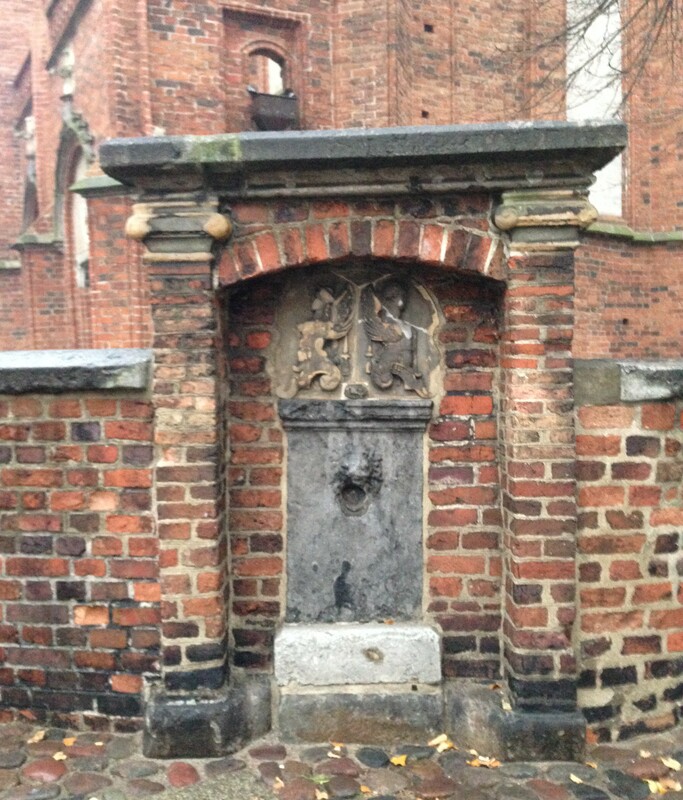 Next to the entrance of the church is this “Well in the Wall”…it was used to provide the city with water. 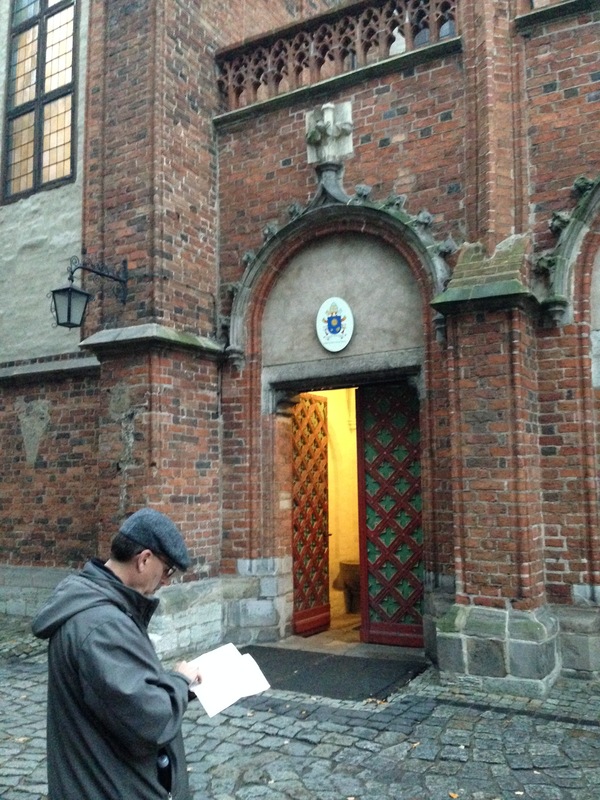 This is David standing by the side doorway to the church. Is anyone surprised that he is looking at a map? 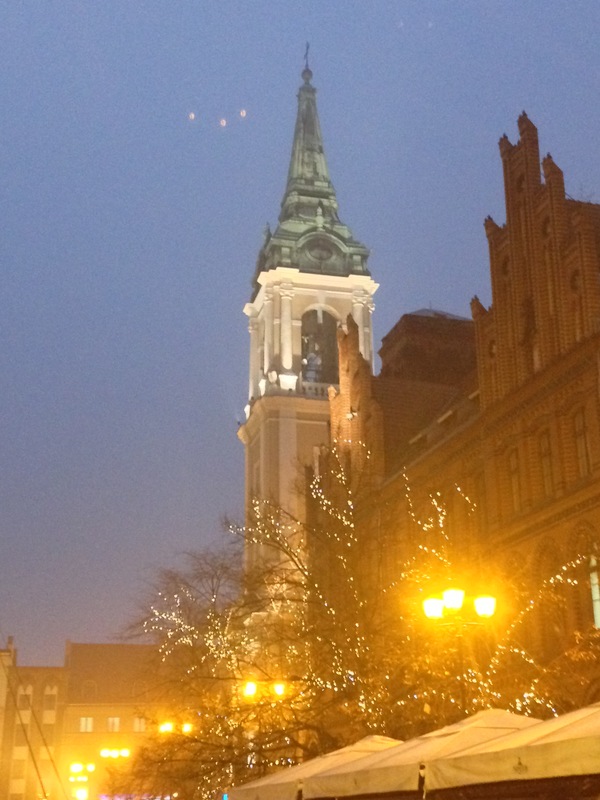 (It’s a walking map of Torun). 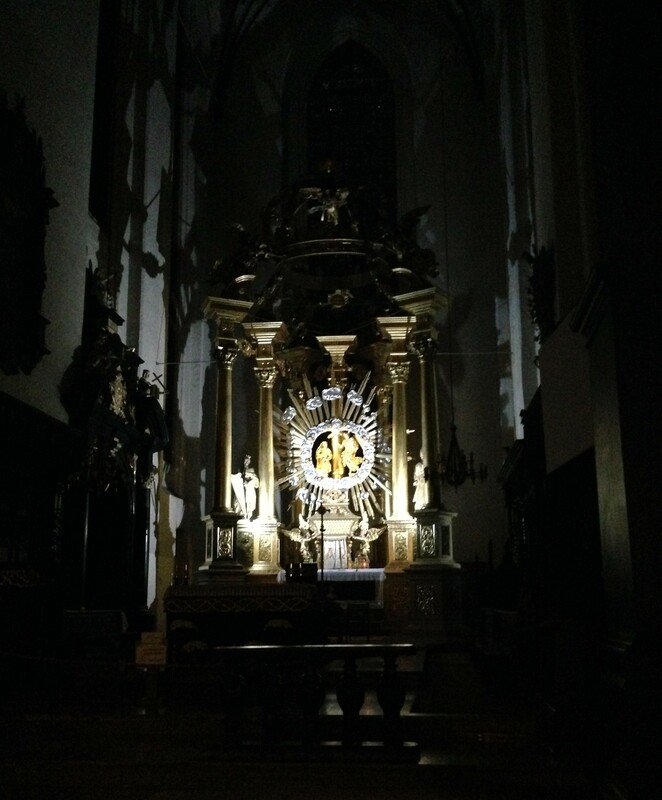 It was very dark (and cold) inside, but you can still see how grand it is inside. 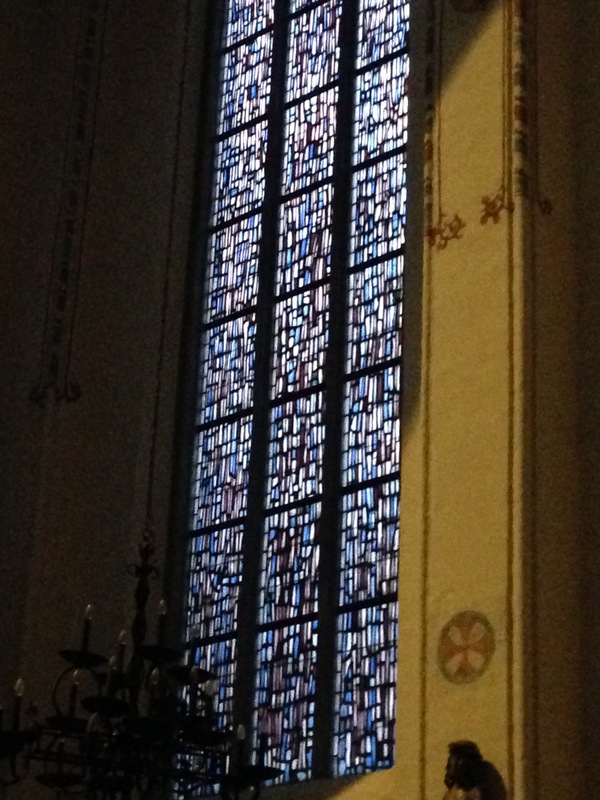 There are some gorgeous stained glass windows. I bet if it was sunny outside instead of gloomy and foggy, the windows would be even more impressive. 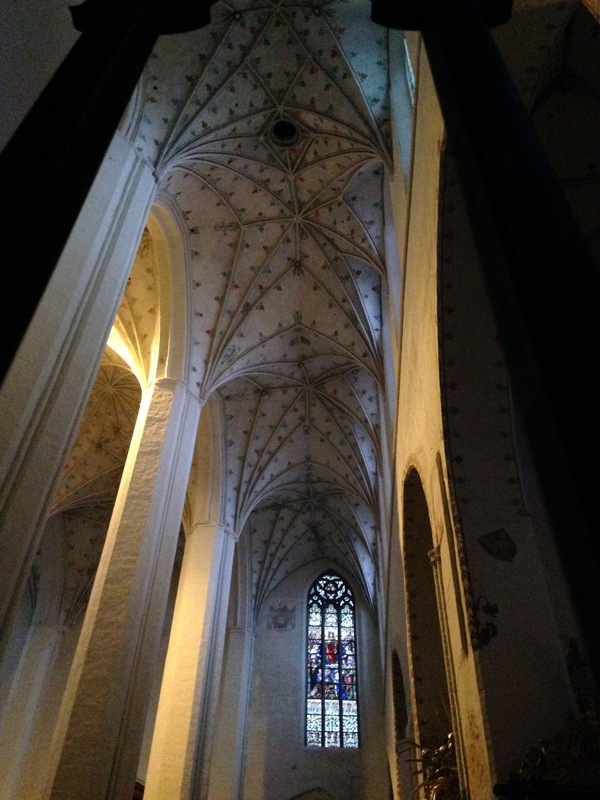 The ceilings are also worth looking up….way up….27 meters up… to see. 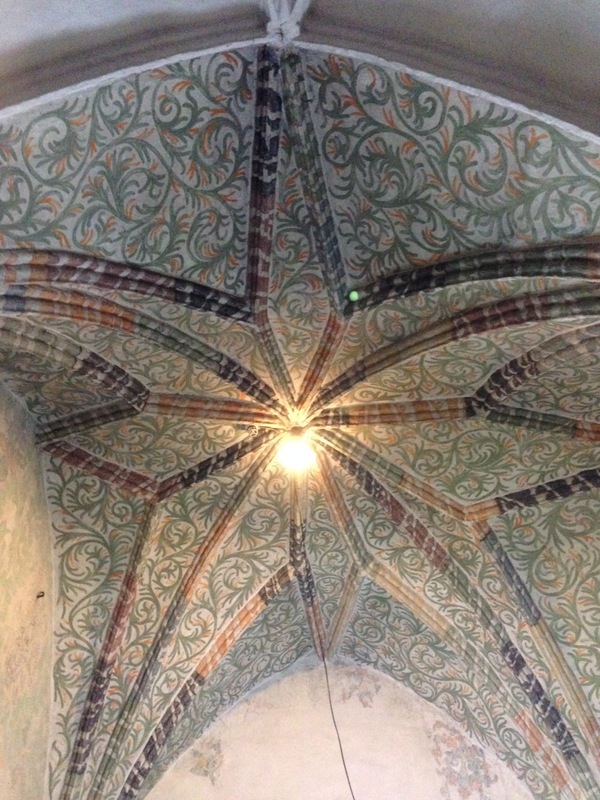 It’s a design that is starting to look familiar as I’ve seen that same “star-like” pattern in many of the other churches. 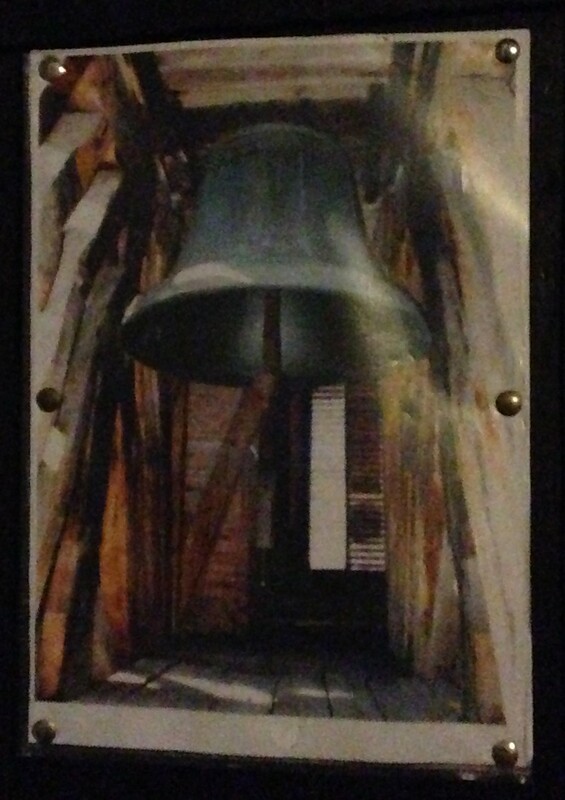 There is a bell tower too…the entrance door is locked, but they have posted a picture of what the bell, the Tuba Dei, the third largest bell in Poland, looks like. 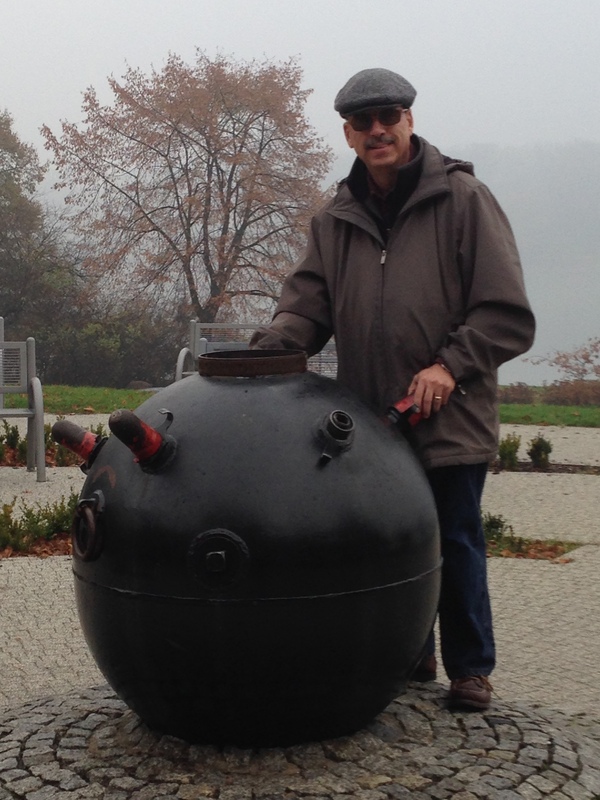 It weighs a measly 7.5 TONS! 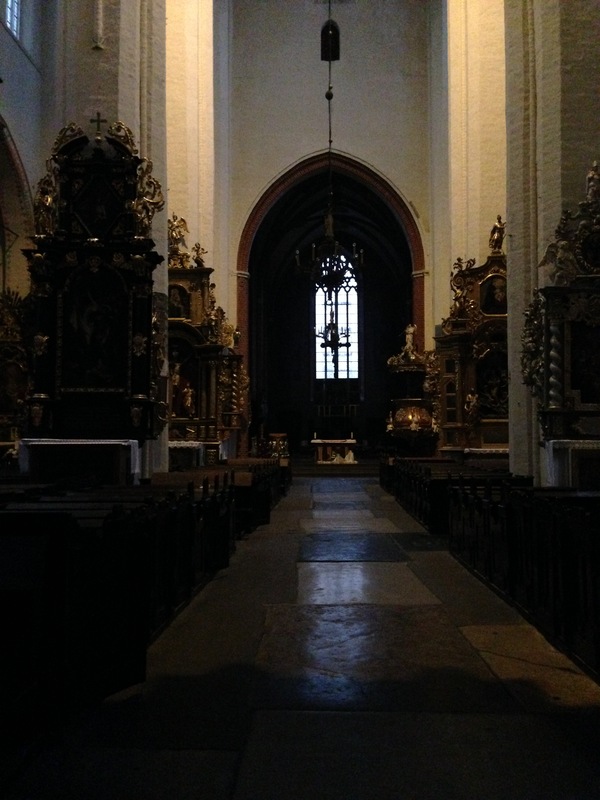 These are a few shots of the backside of the church and a tidbit of info…it is believed that Nicolaus Copernicus was baptized here. After leaving the church we walked down to one of the other medieval city gates. 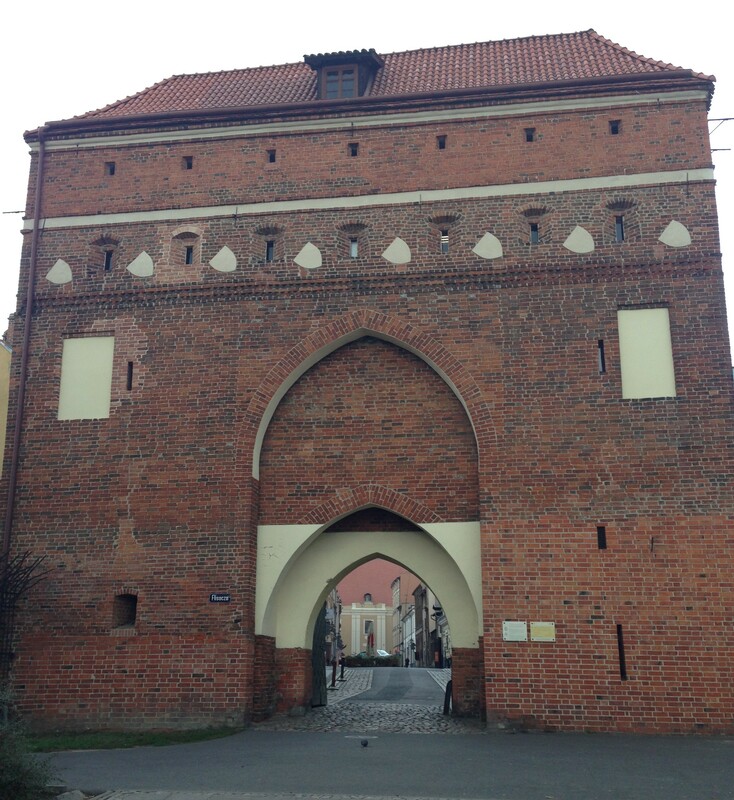 There were originally 12 gates, all built during the 1400’s in the city wall that surrounded Torun. 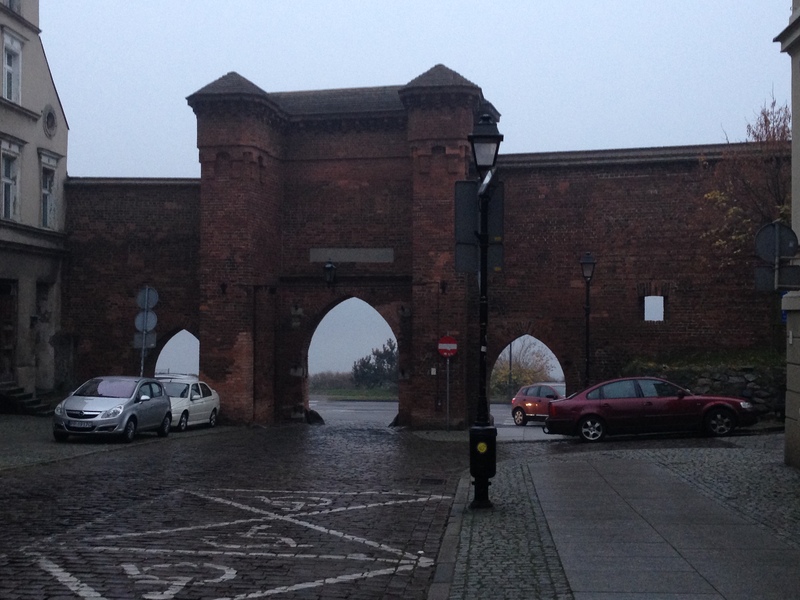 Today only three are left, The Bridge Gate, the Convent Gate and the Sailor’s Gate in existence. The other 8 were dismantled along with parts of the old city walls. We walked back to the main street of the historic district. 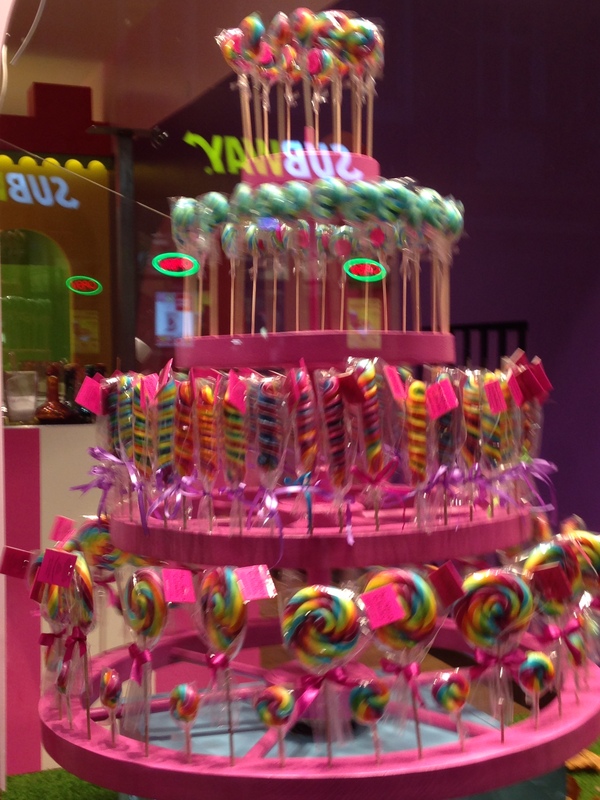 This candy shop was so brightly lit in contrast to all the surrounding buildings that it really stands out. And yes, I resisted the urge to go and buy one of everything. Although I did a lot of drooling at the window. Towards the Old City Market Square there is a statue of Nicolaus Copericus himself. Erected in 1856, the statue stands in front of The Old City Town Hall. Did you notice he is holding an astrolabe? Across the way is this church, The University Church of the Holy Ghost also known as the Church of the Holy Spirit, which I showed you in a previous post. But when it’s cloudy and foggy out, the interior doesn’t look all bright and white and cheery. Just a few steps away is another church…The Church of the Assumption of the Blessed Virgin Mary, which was originally used by Franciscan Monks. 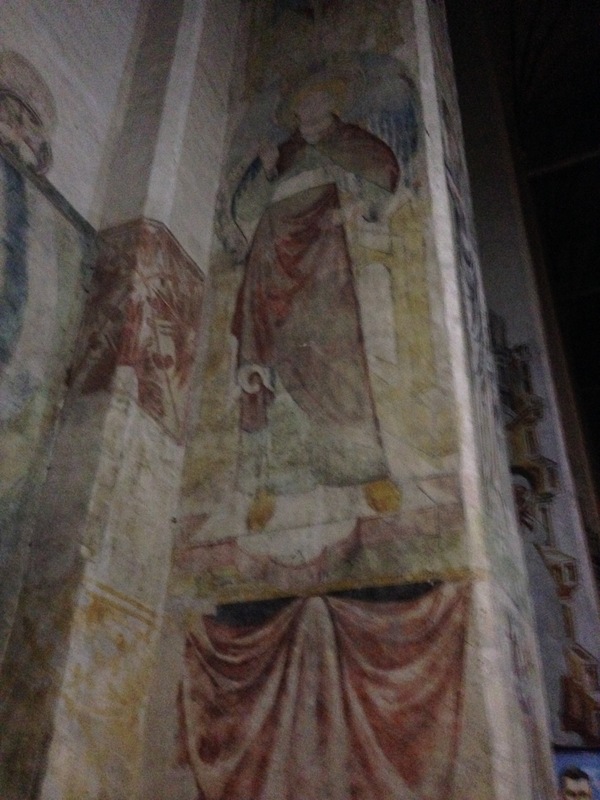 One of the first things you see when you step inside are these frescoes on the wall. 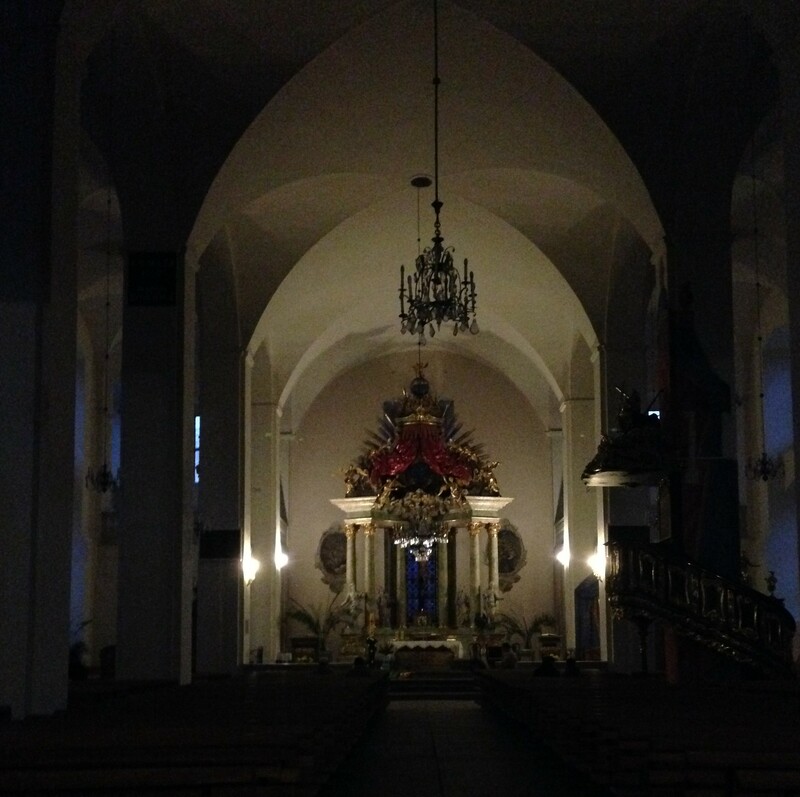 It was really dark inside, the only lights were on the altar area. Except on a side passageway, the ceiling was well lit! (again, the star-like pattern). Just so you know, the design is all handpainted! Hands up for who wants to spend hours painting this ceiling? Just as I thought…no volunteers. Once we came out of the church, we walked around the back of the Town Hall building and a few Christmas lights were going up. 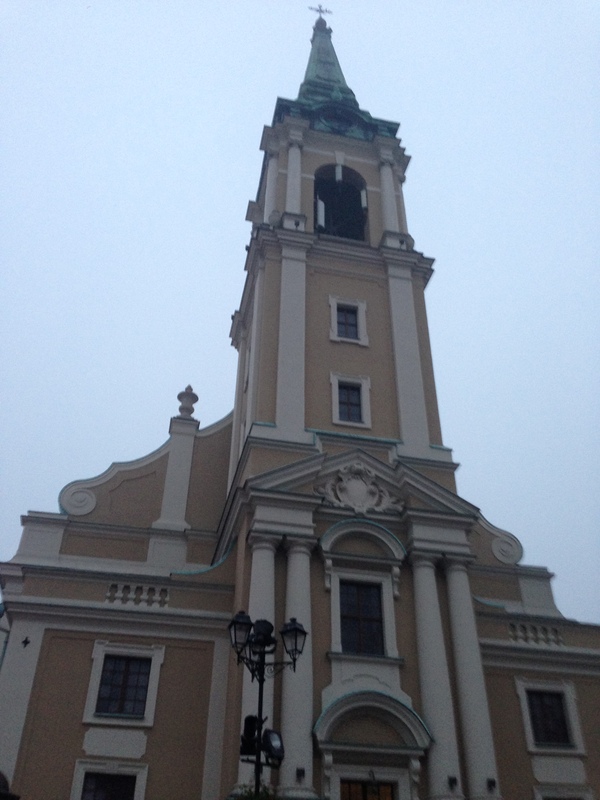 The Old City Town Hall was built and expanded between 1273 and 1385. The tower is the oldest part of the building and served as a watchtower. The building housed merchant halls (the Cloth Hall), bread benches, the city scales and the Judicial Hall plus municipal offices, like the Town Coffers room. 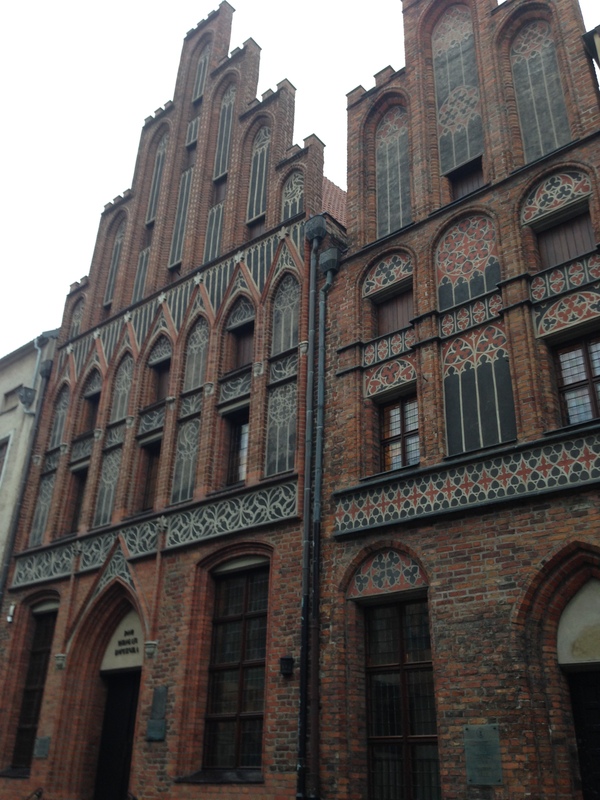 Since the 1860’s it has been the home of The District Museum of Torun. 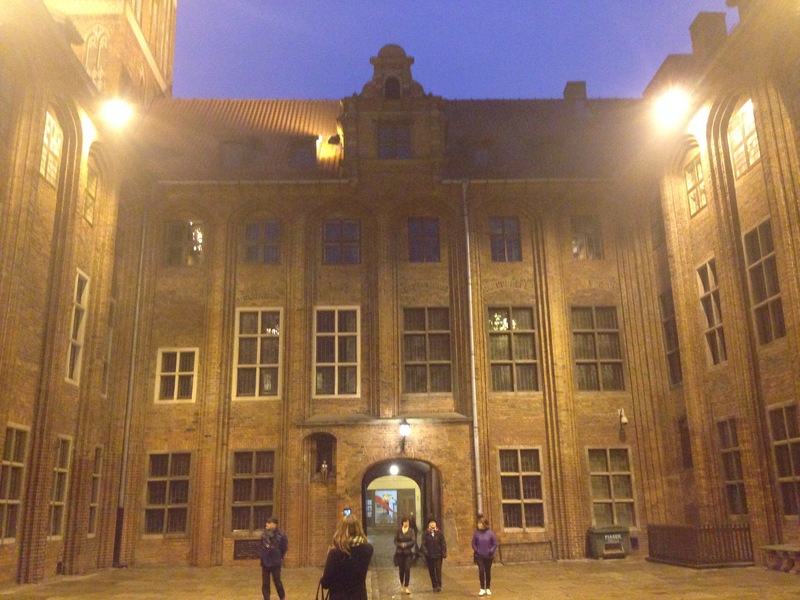 This building is a quadrangle and has an open center in the middle. 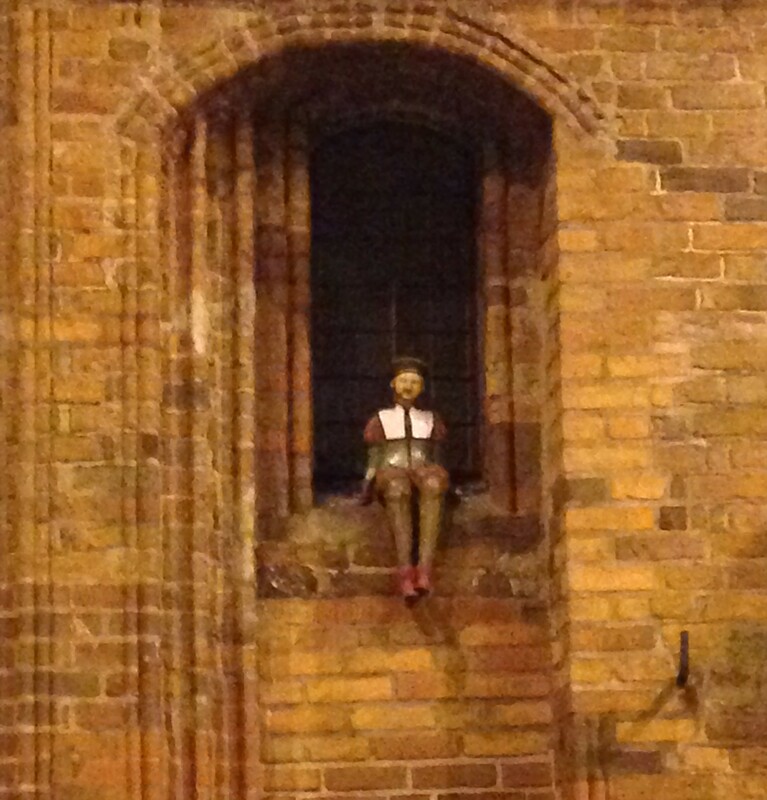 There are tiny people in the windows. I’m not sure of the significance of those tiny people that are in some of the windows. Is this guy thinking about jumping?? 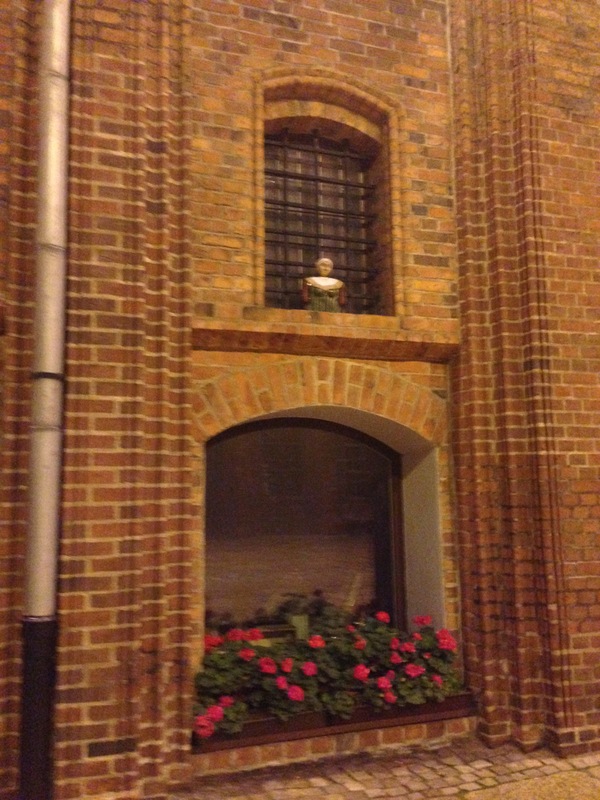 (He’s in a window next to one of the “tunnel” entrances that are on opposite sides. Ok, so curiosity got the better of me and I needed to know more about these “people”. 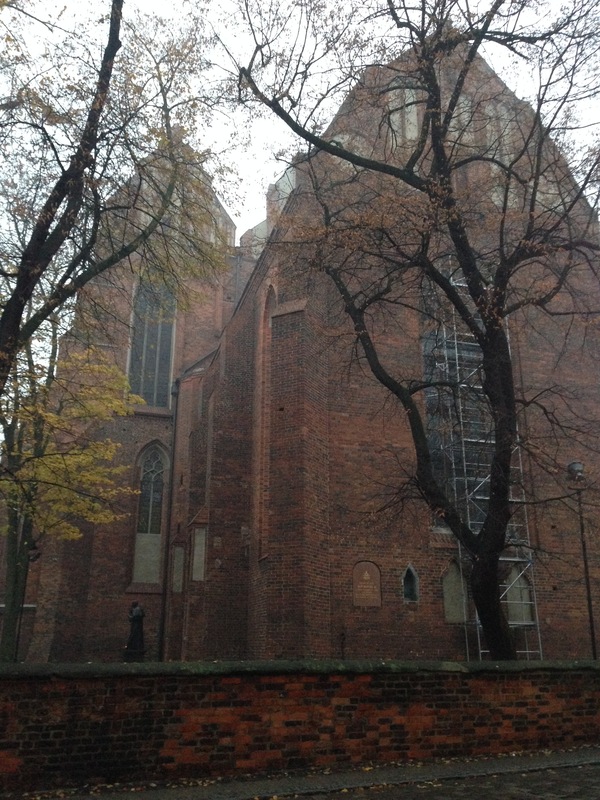 These “people” have only been sitting on different sights in Torun since 2007, no nothing really historical. 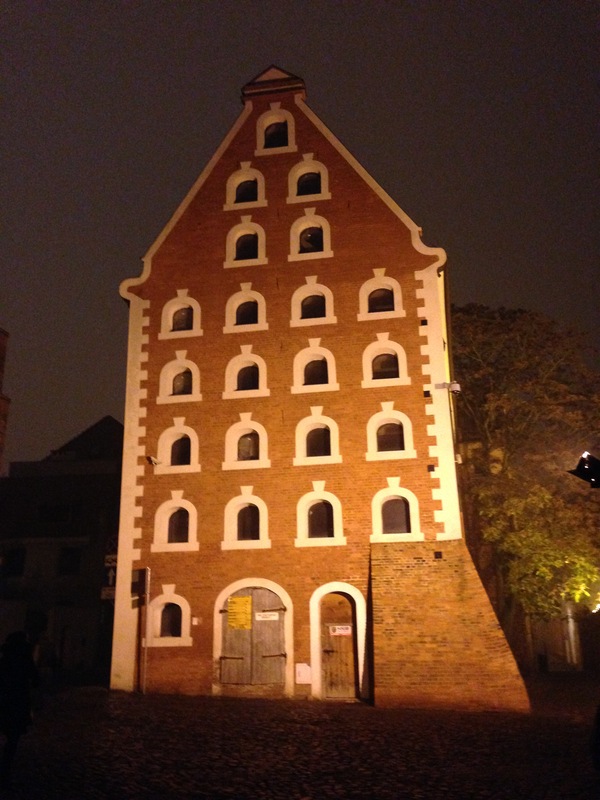 They are ceramic figurines made to look like Burghers and were created by local artists for the tourists to “provide some insight in to the clothing culture and habits of the people traversing the gothic streets.” On our walk back to the car, we went past this building. I love the “bell” windows. 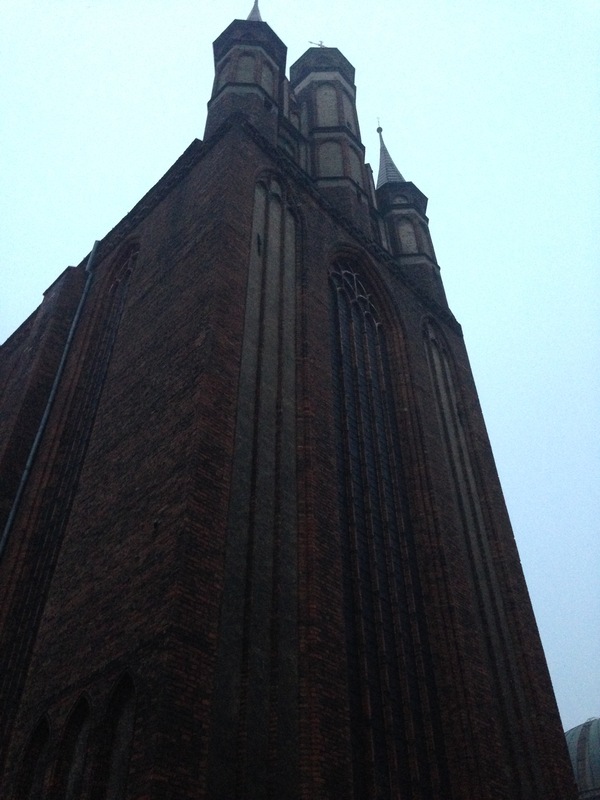 We also walked past the “Leaning Tower of Torun”. 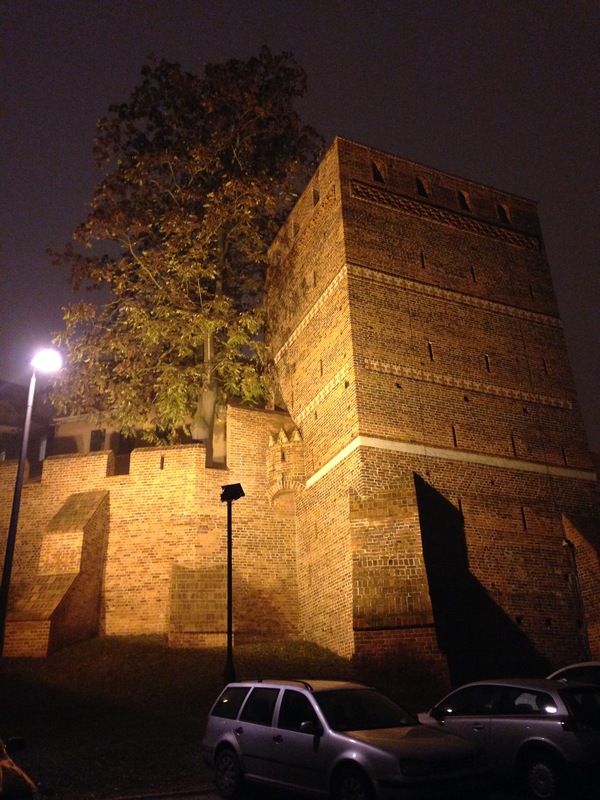 It was built in the 13th century and is part of the defensive wall that surrounds the city. It leans 4’11” off vertical center because it was built on loamy ground. In the 18th century it was used as a women’s prison. A local legend about the tower goes like this: In the tower, there lived 12 knights of the Order of the Teutonic Knights, who were forbidden to meet with women. However, one monk fell in love with the daughter of a rich merchant, and met her in secret, thus breaking the monastic rule of the Order. 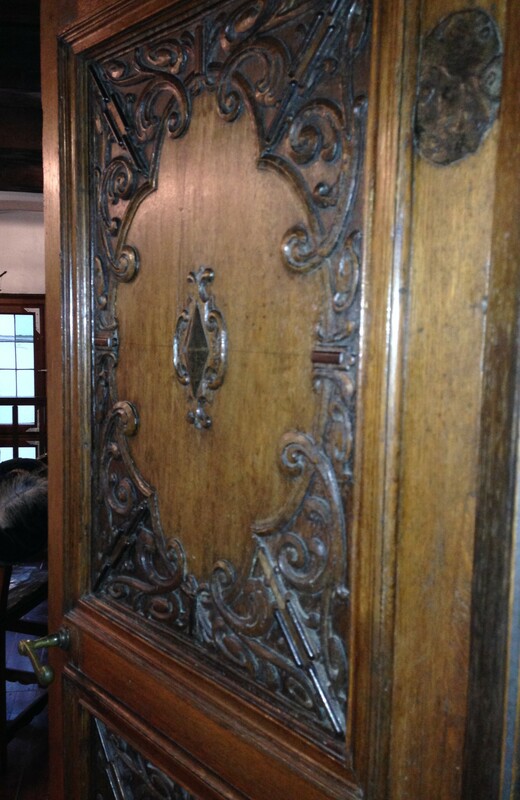 The residents of the town discovered this and reported them to the commander and the city authorities. Both lovers were fined, the woman was sentenced to 25 lashes, and the knight was ordered to build a tower. However, the tower had to be tilted, in the same way as his conduct had deviated from the monastic rule. To this day, legend has it that those who have sinned are not able to keep their balance under the tower. 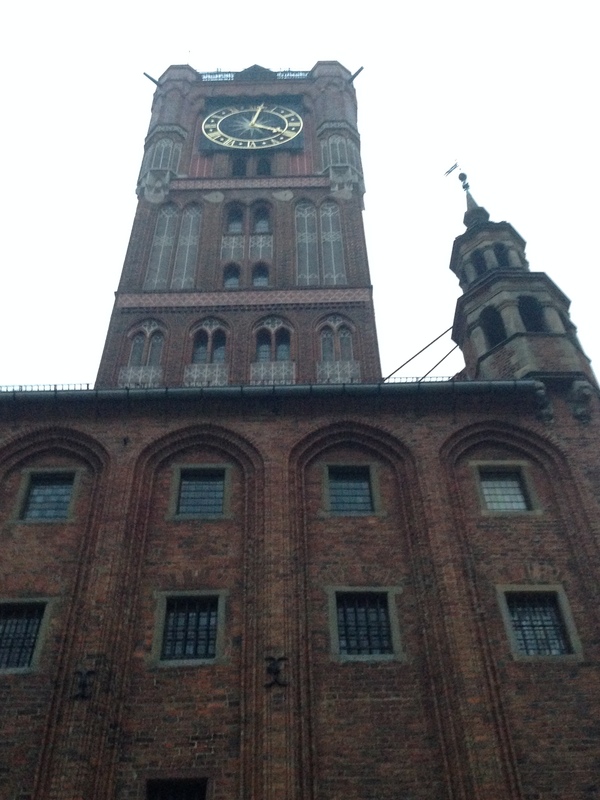 I didn’t walk close enough to the tower to see if I was a sinner…. Thanks Pat. You provide very interesting stories and pictures. What history this area has!